So we sailed slowly on and after travelling for 17 days we arrived at New York on Sunday afternoon the 29th. The wind had been against us all the time, otherwise (as it had been calculated) it could have been done in 12 or 13 days. Yet we had to stay off shore from that Sunday afternoon until Monday afternoon when we were taken to Castle Garden and there we had to pay again for the remaining stretch to Milwaukee — 46 and a half dollars as well as 6 dollars for the excess weight of the luggage. Then we were taken from Castle Garden to an Inn. There that man Vogel made an agreement for a dollar a day for each of us, but when we came to pay we were charged two dollars. We did not like that too much: six dollars for the three of us. In spite of the fact that Harmen Jan here, in 1865, has the feeling that they were overcharged in the inn where they spend the night after their departure from Castle Garden, their voyage and journey had already taken place under much better circumstances than those encountered by their Uncle Gerrit Willem Bloemers and Aunt Janna Bloemers-te Selle in 1842 on their trip. As mentioned in the Emigration to America section of this website, the circumstances under which the European emigrants arrived in America had improved significantly since 1855. In the early period of emigration the passage to America was a perilous undertaking. The ships on which the voyage were made were abominable. Extortion for money by ship owners, captains, and crew for the voyages made by the emigrants often made the journeys take catastrophic turns. Of 90,000 Irish people crossing the ocean in 1847, 15,000 died either on their way or immediately after arrival in the hellish quarantine stations. On board, women and girls were in the greatest dangers from the crews. In November 1853, the twenty-eight emigrant ships that arrived in New York showed a loss of lives totaling 1,141 out of 13,762 passengers. As a consequence of these statistics, the American press started a campaign against the “damned pest ships and floating coffins,” and Congress passed a law which fined ship owners ten dollars for every death on board. 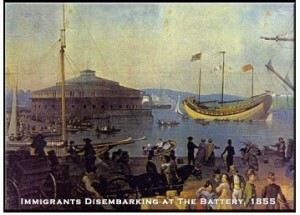 Once the emigrants landed, they were swarmed by shady characters who relieved the new arrivals of their last few cents. The American coastal cities were centers of vice, robbery and other crimes. If immigrants came safely through those two initial zones, then they met with the gamblers and the cheaters on the riverboats, who also gladly made use of the emigrants’ naivety. At the place of destination, there were many more perils stacked against and waiting for our earlier relatives who boldly took on emigration to a new land. The newly passed law, not surprisingly, was a blessing for the immigrants. Harmen Jan and Jan Hendrik– both born at farm “De Selle”– were not the only ones received at Castle Garden, a former fortification in front of New York’s harbor. Many other family members and friends also first set foot on American soil here at Castle Garden. And so they arrived from the farms “Diekebosch”, “Graaskamp”, “De Stegge”, “Oonk”, “Rooks”, “Kampershuisje”, “Meekes”, “Tenkink-Kavenstee”, “Fökkink” and “Fökkinkschoppe”. Although the United States by 1783 had clearly gained independence from England, the British still had a presence in North America. The fact that the Americans were great friends with Britain’s archenemy France was not particularly appreciated by the English. As of 1803 the United States was doing a good business with Napoleon. He agreed to sell Louisiana, the last French colonial property in America, to the United States for the amount of 15 million dollars. The new United States and England continued to quarrel about Indian affairs, and both lay claims to territories in the West. In addition, there was a lot of trade competition. In 1809 the Republican James Madison becomes President of the United States. He is persuaded by his party to enter a second War of Independence (1812 – 1814) by declaring with Great Britain to pursue expansion into the Northwest Territory of Canada, among other reasons. In this war the mighty British fleet launches attacks at the American coast. The Americans cannot prevent the city of Washington from being destroyed in these actions. General Jackson defended New Orleans with a great deal of difficulty. In 1814 the United States and Great Britain sign the Treaty of Ghent. Under the terms of the Treaty, Great Britain conceded to restoration of the situation already existing before the breakout of the war. The Great Lakes were neutralized. The American Revolution had painfully taught New Yorkers that their city needed better protection against enemy fleets. Between 1807 and 1811 a stout circular sandstone battery was erected as a harbor fortification just off Manhattan Island’s southern tip. It stood off Manhattan Island where the Hudson River and East River join. The Dutch had built a fort nearby on Manhattan Island in 1625. At the same time four other new forts were constructed to defend the harbor of New York. The second war of independence brewed. First called Southwest Battery, and off shore then, it never fired a shot except for target practice. Changes in naval guns and in relations with European powers soon made forts like Castle Clinton obsolete. As New York City developed into a world metropolis, the city needed a public venue for cultural events. In 1824 Castle Clinton became the open-air Castle Garden. Revolutionary War hero the Marquis de Lafayette of France launched his triumphal return visit to America here later that year. 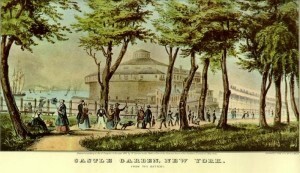 From 1824 to 1855 Castle Garden was the largest public assembly hall and entertainment center in the United States. Presidents and other dignitaries would be honored here. Samuel F.B. Morse displayed his telegraph invention. A roof added in the 1840s made even grander events possible. Promoted by P.T. 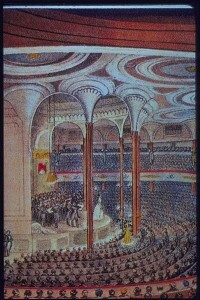 Barnum, later of circus fame, the wildly popular Swedish opera diva Jenny Lind made her American debut here in 1850, enthralling her audience of 6,000 (see photo right). During that same time period the city began land reclamation between the fort and the mainland. 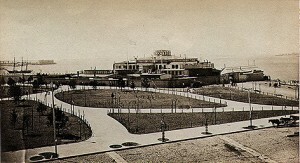 In 1896 the Castle was transformed into the New York Aquarium, one of the nation’s earliest public aquariums. Its opening day in December 1896 saw 30,000 people pour into the New York Aquarium to marvel at creatures from the nearby waters. Soon it featured species from around the world. Its West India harbor seal became a city character. When the aquarium closed in 1941, its sea creatures went to the Bronx Zoo and later to Coney Island. Beginning in 1941 much of the Castle Garden area and structures were demolished in preparation for construction of a New York tunnel project. Concerned citizens petitioned Congress to halt the destruction of the remaining historical Castle Garden structure. At that point only Castle Garden’s nineteenth century walls remained standing in tact. Fortunately the remains of the Castle were saved from the wrecking ball by designating the building as a National Monument. Saved from demolition in 1946, the Castle in the 1970s was restored to its original look as a fortification and now serves not only as a museum, but the ticket office for the Statue of Liberty and Ellis Island ferry. One-stop search for all immigrants entering through New York between 1830 and 1912. This search site includes pre-Castle Garden (1830-1855), Castle Garden (1855-1890), Barge Office (180-1891), and Ellis Island (1892-1912). This search engine uses the database provided by CastleGarden.org (see below). CastleGarden.org is an educational project of The Battery Conservancy. This free site offers access to an extraordinary database of information on 11 million immigrants from 1820 through 1892, the year Ellis Island opened. Over 100 million Americans can trace their ancestors to this early immigration period.